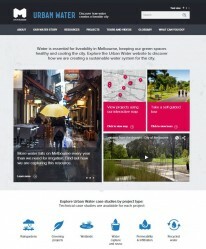 City of Melbourne launched an exiting new website - the Urban Water website. It shares information on their Integrated Water Cycle Management projects through the use of fantastic animations, videos, infographics, case studies and self-guided tours. As well as providing general information for the public about sustainable water management, the website provides detailed technical case studies that include cost information and plan drawings. In coming months the website will also share live data about the City’s stormwater harvesting systems.